The last time I reviewed this role playing game was in the year of our Lord 2008 on the Nintendo DS. It was an enhanced port of the 8-bit NES game. Fast forward to 2014, and Dragon Quest IV Chapters of the Chosen has been released on the iPhone and iPad. It is amazing old Nintendo DS games can be ported over to the iOS and Android platforms. Back in 2008 the ESRB gave Dragon Quest IV Chapters of the Chosen an 'E10+' for Everyone ten years old and older. Many thought this hand held role playing game should have gotten the thirteen and older rating. Why? Take a look at the descriptors the ESRB found: "Alcohol Reference, Animated Blood, Mild Fantasy Violence, Mild Language, Simulated Gambling, and Suggestive Themes." Apple missed a few of the issues with Dragon Quest IV Chapters of the Chosen since their rating only found Infrequent/Mild Cartoon or Fantasy Violence. Is the other content in Dragon Quest IV Chapters of the Chosen on the iOS? Yes it is. Apple should have to pay Family Friendly Gaming a fine for their major blunder. Dragon Quest IV Chapters of the Chosen is a turn based role playing game. You start with one person and build a party as the story progresses. Players go into church to confession their sins. That is how saving is done in Dragon Quest IV Chapters of the Chosen. A major problem the majority of families are going to have with Dragon Quest IV Chapters of the Chosen is the preaching and teaching of a goddess. I know how Family Friendly Gaming Nation feels on this topic. It is like these companies are purposely poking Americans in the eye. Why is controversy and offensive content like that included? Family Friendly Gaming has exposed this issue for close to a decade now. Obviously the people who write and translate these games are proselytizing their beliefs. Expect some old school violence in Dragon Quest IV Chapters of the Chosen. Players enact an attack and an animation is shown hitting the enemy character. They are all pretty small on this platform, but visible. There is also enticement to lust in Dragon Quest IV Chapters of the Chosen. Expect language in Dragon Quest IV Chapters of the Chosen that your family could find offensive. Which is a shame because the musical track is orchestra quality. I could listen to these songs again and again. If the app did not drain my battery so quickly. The controls can be a bit on the clunky side since there is no real world controller. The on screen D-pad is passable, but difficult to use. Then moving my hand from that to a person to talk to was frustrating. Mainly because NPCs like to walk around. They would walk out of range and I had to move over to them again. Long time fans of Dragon Quest IV Chapters of the Chosen will appreciate Party Talk, Wagon Quest, AI Battles, and the Extra Chapter. 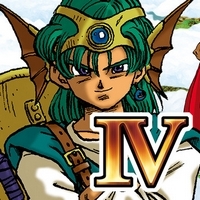 There are five chapters in Dragon Quest IV Chapters of the Chosen on the iOS platform. One less than the Nintendo DS and Playstation remakes. Still the chapter system is nice to see, and a fun way to tell a story.